Summer is right around the corner, and you know what that means – lots of fresh new recipes to try! 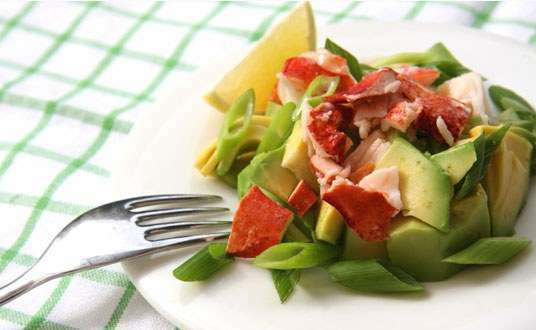 Lobster salad is a great way to pack in some protein for a light and tasty summer lunch. Adding green beans, apple and avocado to some sustainable lobster meat ensures the dish will be a bright, colourful addition to any summer BBQ. With a yogurt and mustard dressing, a little bit of crunch and a whole lot of lobster, this salad is sure to impress seafood lovers everywhere. Want to turn up the heat this summer? Originally a classic Singaporean crab dish made in a potent red chili-garlic sauce, lobster chili makes for a spicy, sustainable treat. Chopped garlic, chicken stock, ketchup and sambal oelek (a spicy, Indonesian chile sauce) are simmered over high heat for two minutes, left to cool, then chilled to be used as a mouth watering spicy dip. Boiled sustainable lobster meat and bok choy can be refrigerated overnight for a faster preparation time. Make the spicy herbed butter by combining butter, garlic, jalapeno, parsley, lemon juice and chives together in a food processor and mix until well combined. Season with salt and pepper and now you’ve got a nice twist on your typical lobster butter reduction. Grill your lobster flesh on one side, then the other until opaque and firm, and begin grilling your fresh summer veggies, drizzled in lemon juice and olive oil, until tender and browned. Make this recipe even more sustainable by buying only fresh, locally grown, summer season vegetables. Why use sustainable lobster meat? Seafood is a healthy addition to our diets. It’s packed with nutrients such as omega-3 fatty acids, proteins and disease-fighting minerals. There are many benefits to seafood, but the biggest benefit comes from buying it sustainably. One issue with commercial fishing practices is that with lobster survival rate being so low, a large lobster in the ocean provides a much better chance of producing eggs, and in turn, a better chance of those eggs increasing the population. CSF is working to stabilize the lobster population and feed the demand for lobsters in a sustainable way. We take lobsters out of the ocean in the post-larval stage and raise them on land. Our practices make the most sense environmentally and economically, if more people bought into the CSF franchise and raised more lobster on land the way we do, the population could be sustained and there would be more lobster for your delicious summer recipes. Try these three lobster recipes with sustainable lobster meat and tell us what you think in the comments below! News from the Farm: Schoolchildren Visit the Lobsters!